Puradigm, an international platform promoting health and wellness through innovative products, chose Ninthlink to create an effective marketing communication plan, including full-color brochures and product data sheets, to support their dealer networks when presenting and offering health solutions to industries around the world. Corporate Overview: a full-color brochure introducing Puradigm as a global company founded to research, develop, and deliver proven products and solutions for today’s most serious environmental and health challenges. Solution Manuals: full-color brochures for Commercial, Residential Air & Surface, and Food Safety industries, which highlight Puradigm’s products and the solutions they offer to combat health issues in each area. 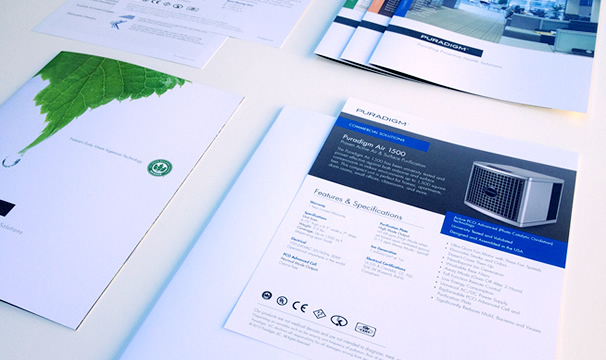 Product Sales/Data Sheets: double sided one sheeters, explaining specific features and benefits of each product to support representatives throughout the sales cycle. From websites and marketing collateral to business cards and signage navori.com/digital-signage-software/ team can support your brand no matter what.